Precious metals expert Michael Ballanger discusses the importance of caution and timing in gold investment. Back in early March, with the HUI screaming along north of 150, I published "Patiently Climbing Aboard the New Golden Bull," in which I opined that we had entered a brand-spanking-new bull market in precious metals and related equities. 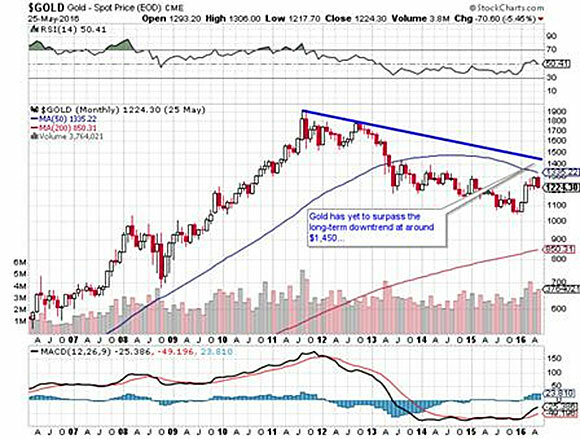 But I also noted that, with the Relative Strength Index (RSI) above 85 on the daily SPDR Gold Trust ETF (GLD) and approaching 80 on the daily NYSE.Arca Gold BUGS Index (HUI), the short-term outlook was less than appealing, while the intermediate and long-term outlook was unequivocally bullish for the first time in five long years. When that report went out, the next ten days was spent fending off a barrage of nasty, spiteful emails as to why the commercials no longer mattered and why the COT was a "useless tool" ("just like the author of that report"). 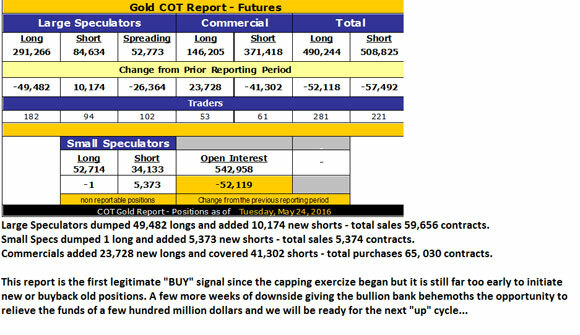 In fact, for the next two months the COT continued to erode, with prices of gold and silver elevating modestly and with the miners going literally "vertical" as the number of "ha-ha" emails was directly proportionate to the move in the HUI. It got to the point where I was sledge hammering the liquor cabinet before lunchtime. However, as is usually the case, the COT, while failing as a timing tool, proved to be a valuable directional indicator and gold and the miners have finally rolled over, offering me vindication (of sorts) and a chance to cover the hedges and add to my favorites PATIENTLY. I said this would be a "nasty week" and it surely was, with mostly everything shiny under pressure. 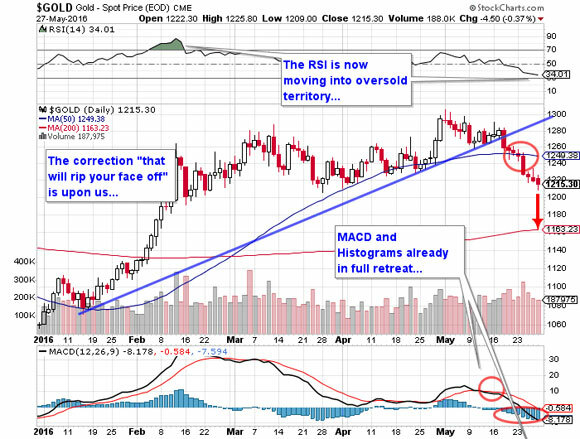 The chart below shows a clear blow-off in the miners in the move up to 236 with RSI above 70 four times between February and May with two Moving Average Convergence/Divergence (MACD) negative crossovers and dramatically weakening momentum. The HUI has broken 200 today and the gold has "given" $1,220 so the washout that I expected and which the Commercials ORCHESTRATED has come to bear and there will be more next week. (And NO—it won't be "different this time"). Silver appears to under less pressure today in the sense that the gold-to-silver ratio (GTSR) is dropping again (74.58) and that is what I wrote about back in April—you are better off buying silver than you are gold with the GTSR trading where it is. Looking out long term, you can see that silver has clearly broken the long-term downtrend line but gold still needs to surmount $1,450, the line drawn off the double tops in late 2011 and late 2012. For that reason, I believe that accumulation of the silver deals and remaining short gold versus long silver is a great way to position one's self into the May-July selloff in the metals and miners. Well surprise, surprise, surprise. . .we are suddenly down $94 off the $1,306 peak back on May 2 and look what the COT dragged in! 65,030 contracts representing 6,503,000 ounces of fairy-tale gold is covered from the nearly 30 million-ounce paper gold short position. Next week's COT will include the crack for the week from $1,250 last Tuesday to today's $1,209 ($41 an ounce), but as you recall from the bottoming process in November and culminating on December 4, the unwind process takes about 3-4 weeks to go through the full cycle. These bastards can just sit there at $1,280-1,300 and short an infinite amount of gold with zero accountability, completely unfazed by margin calls or vault inventory levels until the Large Specs get the "rolling over" signal, and then all hell breaks loose. Now that they have completed the rollover of the moving averages through the relentless feed of bank-fabricated phony "supply," they can sit back and relax as the now-panicked Large and Small Specs scramble to liquidate their late longs into the welcoming arms of the bullion banks. Another near $100 million bonus week for the banksters, and nary a word written about the heist from anyone. And people ask me why I have been calling myself a "cautious bull". 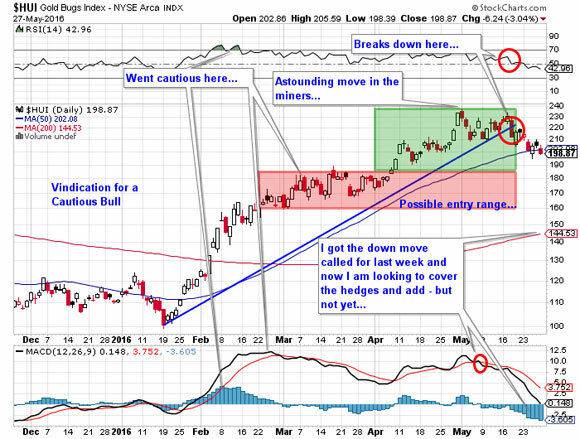 . .
Because the gold market and the miners are now in liquidation mode, the time to initiate hedges has now past. It's too late to protect holdings BUT it's also too early to cover the hedges and add. The RSI, MACD, and histograms are all approaching oversold status with particular emphasis on the RSI that is now just above 30. Under 25, I will be buying long-dated calls on gold and silver scaling into the market with 20% stabs spaced weeks apart until sometime in midsummer.